When asked why he chose Honey’s Thai Pavilion, Eugene’s response was: “Someone told me it’s the best Thai food in the Bronx.” And on the restaurant’s website, www.honeysthaipavilion.com, they repeat what Eugene heard and state it clearly on the site’s home page. I’m not sure how many Thai restaurants there are in the Bronx. 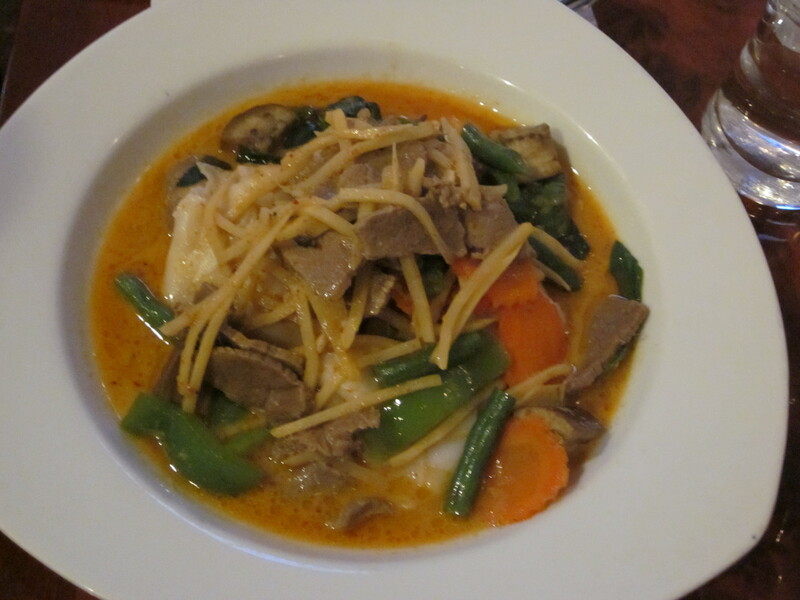 And as far as I know, the Bronx is not known for its Thai food. Still the honor, however it was bestowed, was enough for Eugene to justify our gathering in the Pelham Park section of the Bronx, just under the number 6 elevated train, to see if we would concur with the restaurant’s lofty claim. 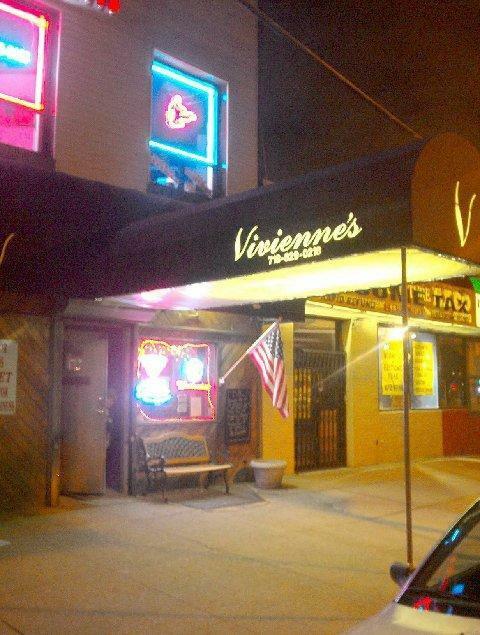 I arrived early and had a beer at Vivienne’s Bar next door to Honey’s. As I sat in the bar with a few regulars in this predominately Italian-American neighborhood, I wondered if Vivienne, who served a cold Corona to me personally, had ever met Honey next door. And then I wondered if there really was a Honey of Honey’s Thai Pavilion. Vivienne, meet Honey. Honey, meet Vivienne. Eugene and Rick were waiting as I entered the sparsely populated, sparkling, diner-like restaurant. Zio was risking the long train ride from Astoria and I noticed there was a message from him on my cell phone. Train troubles apparently. Mike from Yonkers came in soon after I did, and we all perused the plastic-coated menu searching for something that might distinguish Honey’s as the best Thai restaurant in the Bronx. From a quick inspection, the evidence was not obvious. There was the jerky appetizer; pork or beef, and mussels on the half shells. We could try them and hope for the best. 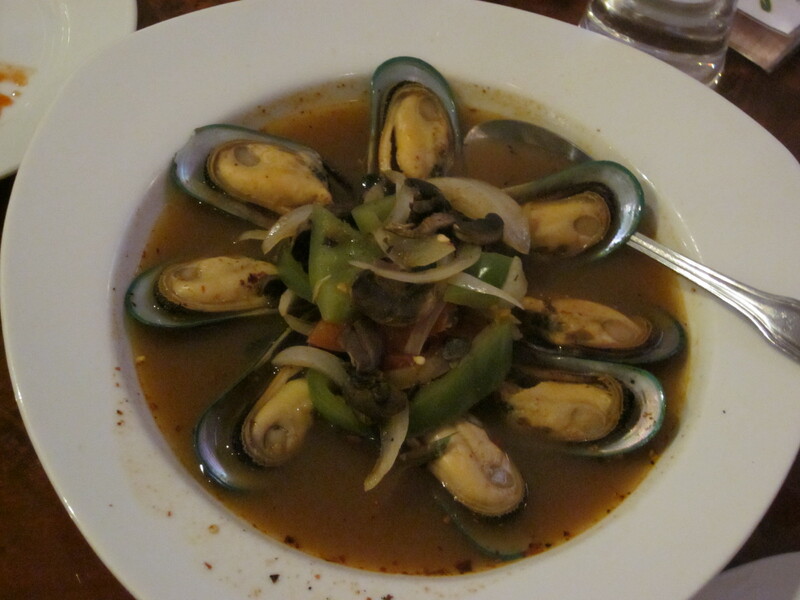 We waited a bit longer for Zio and just a few minutes before he slowly made his way to our table, we ordered the fried fish cakes, the beef jerky, and a bowl of steamed mussels on a half shell in a spicy broth with galangal and lime. Galangal, to those unfamiliar with Thai ingredients, is the more robust sister to ginger. 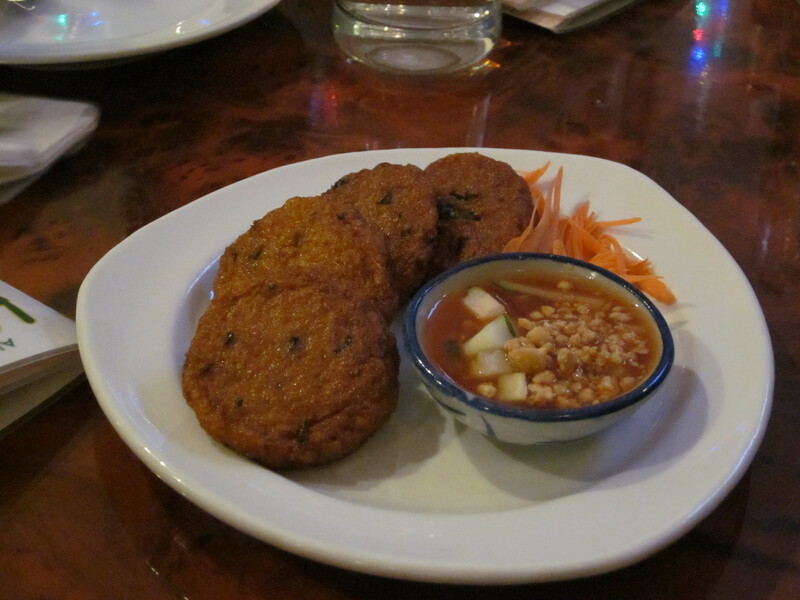 Fish cakes: cooked to a perfect rubber-like consistency. The silvery growth under Zio’s nose, also known to some as a moustache, was the source of our early conversation as we waited for the appetizers. We wanted his reasons for attempting such folly, but he had no explanation for it. Maybe he needed a few of the rubbery fish cakes to help jog his memory. Or maybe one of the over-cooked, and evidently frozen, mussels that were in what was a very good, spicy broth accented by the presence of the aforementioned galangal would do it. But neither helped Zio come up with a coherent answer to the moustache question. And by the time we devoured the addictive sweet and spicy beef jerky that was fried to oblivion and accompanied by a chili sauce (chilly on the menu) we realized Zio needed no justification for his facial hair choices. Mussels (frozen) accented in a galangal broth. The entrees were relatively pedestrian. I was hoping to find something unusual when I ordered the pad key mao, flat noodles with basil leaves, onions and peppers in a spicy chili sauce. Our waitress inquired if I wanted it spicy. I tried to tell her that I wanted it as it should be prepared. Not quite understanding what I meant, she retorted that there were four grades of spicy: mild, medium, hot, and very spicy. I was considering one of the latter two when she suggested the medium as if she knew my tolerance for heat. “I can bring you extra chili sauce if it’s not hot enough,” she reassured me. What arrived needed no extra spice—medium had my mouth nicely charred. 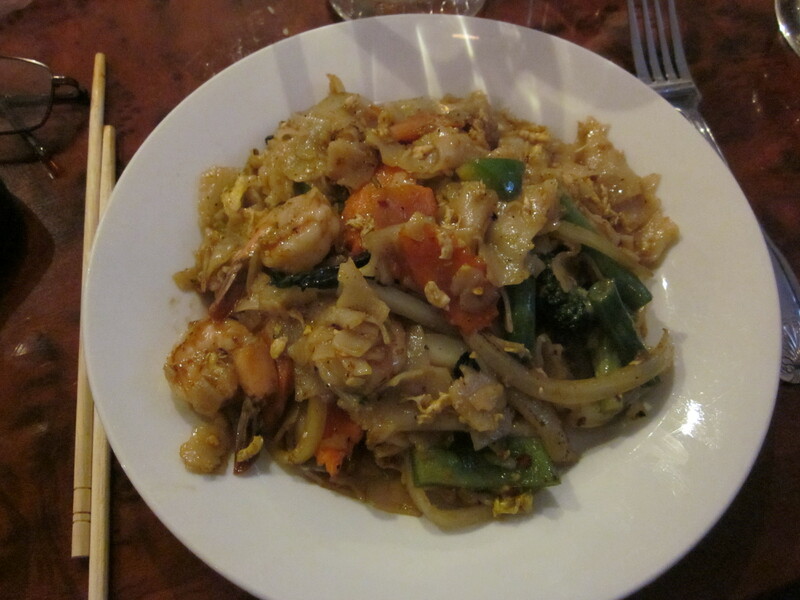 Nothing else that I tasted would have me exclaiming that Honey’s was the best Thai food in the Bronx. And I think the others were in agreement. Mike from Yonkers complained that the chicken in his spicy phik king was over-fried while Zio’s curry noodles with beef brought out a twitch in his new moustache: “There’s no excuse for beef that tough,” he grumbled, though ate it all anyway. The curry noodles with beef had Zio’s sorry excuse for a moustache twitching. I know Rick and Eugene ordered entrees, but I have no idea what they were and I think that tells you all you need to know about Honey’s Thai Pavilion. Bummer the place looked promising I went to Joya in Brooklyn (voted best Thai in Brooklyn or something haha) it was good but not sure of the authenticity of the cuisine since I don’t have much Thai cuisine experience. For the price you get large portions (and it’s cash only) and they have a pretty good bar. However this is a “hipster” hot spot not really my kind of hang out but had an excellent night with good friends. Oh and they have an open kitchen so it gets pretty hot in there.